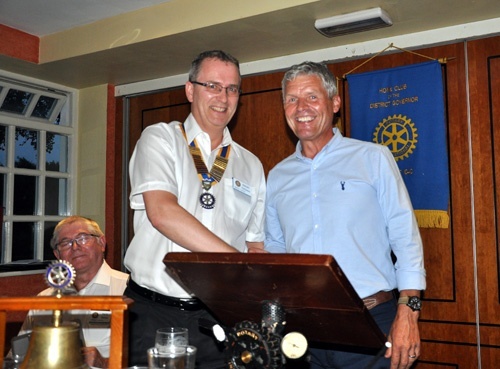 The Club Speaker finder is Secretary Paul Barnes. Mon 16th July Phil Fryer - Being Frank. Mon 3rd Sept - DG Nigel visit. Mon 17th Sept - PCSO Catherine Brown. MON 24th Sept - Sally Simpson - Working for ITV. Mon 15th Oct - Patricia Tayor Rotakids. Mon Jan 16th - Andrew Barnes Deafblind UK Charity. Phil visited the club on Monday 6th July and gave a talk about his life and career. 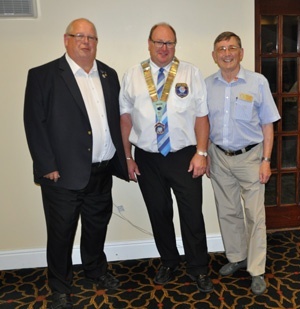 Phil was the very enjoyable entertainment at Nigels District 1040 Handover evening and he agreed to come to give a talk.. He met his wife Karen in 1976 and they invested in a hairdressing shop in Holbeck. Phil talked about his charity work organising and running 10K and Marathons for Charities such as Wheatfields Hospice St Gemmas, Candlelighters and British Heart Foundation raising thousands of pounds. He progressed into Triathlons and then to compete in the Iron Man series. His next step was to break records cycling for a top Yorkshire cycling club and became a good friend of cyclist Beryl Burton. He was introduced by a friend to the singing circuit and through hard work progressed to sing at the Crystal Rooms at Batley Frontier. then onto a Yorks TV 30min documentary shown at Christmas featuring Phil singing in Dubai. He sold his business and after three children and two grand children with Karen he has become a UK wide successful Sinatra tribute singer. Secretary Paul gave thanks from the club for a very impressive insight into Pauls career. Nigel spoke of how he first started in Rotary 18 years ago and how he was inspired before that in a polio aid champagn. Nigel empasized the need for all clubs to focus on Membership. Only in India and Asia were Rotary Clubs expanding and the need for clubs to tell people what Roatary is doing. Nigel talked about the Rotactkids and Rotaract and Foundation and grants and Rotary Central.with 7 bulit points. He talked about his coming District Conferance in Scarourough. 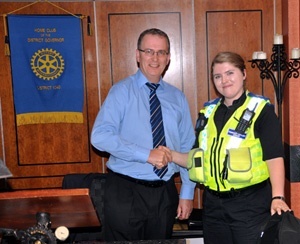 Club Speaker PCSO Catherine Brown. based in Heckmondewike and has to travel by bus and then walking but very rarely by police car. She told of her differet roles - investigating ani social behavour, shop lifters, criminal damage, tracing missing people , burglaries and shed and garage. She visits schools and churches giving talks. A concern is Internet saftey and chat rooms warning children of the dangers. She is focused this next week on Knife crime awareness week. She finished expaining her very busy shedule giving visits talks and over the last week. Catherine took questions from Luddites. 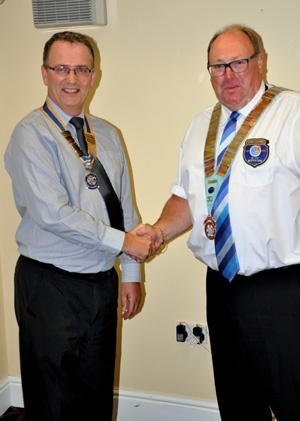 President Jeremy thanked Catherine for her visit to the club. Club Speaker Sally Simpson - Working for ITV. Mon 24th Sept 2018.
half years at the Yorks Post in Bradford. Sally said she didnt want to work for a National and as worked for Calendar for 11 year now. Sally works all hours reading the headlines during both morning and evening news bulletins. as a Journalist, writing bulletins and eventually got the opportunity to present Calendar news. Sally explained where they get their sources and that U tube was a big sources of news and that pictures tell the story. A video was then shown of Sally on Calendar news and on outside broadcasts. In her Journalist role she as interviewed members or Royalty and famous artists. writing bulletins presenting news and doing outside broadcasts for the news bulletins. Rotarian John Sugden gave tanks to Sally for coming to speak to the club. John talked about Sally when she attended the club as a child with her parents , Martin her father is a founder member of Birstall Luddites. Sally pictured above with President Jeremy. LINKS - Meet working Mum Sally. 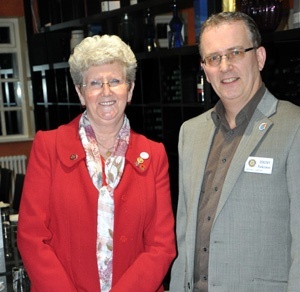 On Mon 15th Oct Patricia Taylor from our neighbouring Rotary Club of Batley came to the club to speak about Rotakids . Patricia recently gave a talk at the District 1040 Conference on the subject. their local area. plus two Interact clubs. There are now 10 Rotakids clubs in District 1040. 2 in Hull, 2 in Batley and schools in Bradford. Rotakids clubs are for 7 to 11 year olds. Teaching them how to run the club electing their own President and secretary and their own charity, using English and mathematics to plan and vote for the chosen charity. A Rotarian should give around half an hour a week to help the Rotakids meeting this period to fit the school timetable. The Rotarian to be CRB checked. Ask RIBI to Charter the club with possibly the DG being present. The Children have to learn the Rotakids pledge. Sals shoes Charity. In many countries you cannot go to school without a pair of shoes. Club Speaker - Andrew Barnes - Deafblind UK Charity. 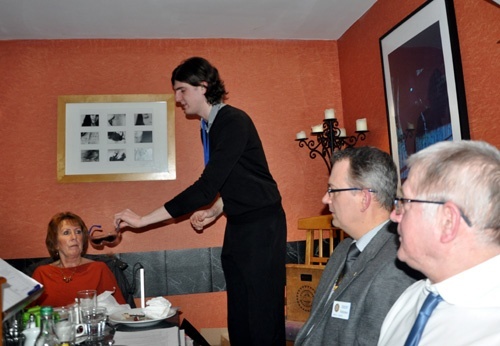 On Mon 14th January Andrew came to Gomersal Park Hotel and gave a talk about the Charity Deafblind UK. Andrew is the nephew of Luddite Rotarians Katherine and Paul. Matthew is Andrew's older brother and was diagnosed first with loss of hearing aged about 2, just before Andrew was born. Both were then diagnosed with the same genetic problem that causes moderate to severe hearing loss. Both have gone through school and university and their mother has done all she can to get them supported through their education. Andrew was more willing to accept any support available and has always had the vocation to help other sufferers of hearing loss in some capacity. He applied for the role of Engagement Officer for the charity Deafblind UK in June 2018. Because of his own experiences, he has a lot to offer to the role and he covers a substantial area, both raising awareness and giving advice. The Deafblind Charity is a national charity supporting people with sight and hearing loss, enabling them to live the lives they want. Andrew gave a short talk about the history of the Charity which was started in 1928 and in 1928 the Rainbow magazine was founded. In 1963 the Rainbow Centre was built in Peterborough . Andrew talked about the Deafblind Charity and his role. This includes fund raising, organising events, grant evaluations, community outreach, info and advice line giving guidance to people living with sight and hearing loss, giving a wellbeing call for a "how are you" or a general chat. The quarterly magazine is free of charge and available in a range of formats to suit all levels of accessibility: Large print, braille, audio, XL print and XXL print. To give an insight into hearing and sight conditions Andrew passed around different spectacles that reproduced various symptoms -such as peripheral vision quity vision and ear phones to simulate deafness. Above Andrew passing glasses that reproduce slight impairments to his Aunt Katherine. his Uncle Luddites secretary Paul on right with President Jeremy. Paul gave a vote of thanks to Andrew for his talk and said how proud he was that his nephew had made such a success of his life and Charity work.